On April 19th 2016, which happens to be the occult day of “Blood Sacrifice to Baal”, replicas of the Temple of Baal will be unveiled in New York and London. Update: Reports claim that the New York event has been cancelled and that London will instead be erecting the Arch of Triumph of Palmyra. Still awaiting official confirmation. Reproductions of the 50-foot arch that formed the entrance of the Temple of Baal in Palmyra Syria will be installed in Times Squares, New York and Trafalgar Square, London on April 19th. The ruins of the original structure were destroyed by ISIS last year. The Temple of Baal in Palmyra (before destruction). “The temple has been systematically razed, with the 50-foot-tall arch among the few remaining elements of the building still standing. The temple, dedicated in 32 A.D. to the Mesopotamian god Bel, attracted 150,000 tourists per year until 2011, when the civil war in Syria began. The full-scale replicas, now under construction in China, will stand in London’s Trafalgar Square and New York’s Times Square during World Heritage Week in April 2016. The project comes after researchers from the Institute for Digital Archeology — an effort by Harvard University, Oxford University in Britain and Dubai’s Museum of the Future — embarked on a “Million Image Project” to obtain 3D photographic data to reconstruct the arch digitally. The full-scale models are being recreated with the world’s largest 3D printer, and made of stone powder and lightweight composite materials. The structures will be temporary. Despite courageous claims of “defiance” versus ISIS and near-sob-stories about the emotional meaning of the temple for locals printed in mass media, there is much more at stake here. ISIS also destroyed the ancient cities of Nimud and Hatra in Iraq, the Shagraf shrine and the St. Elian monastery in Homs – but it is the Temple of Baal that is being honored, in the two most significant “power points” of the world today. Why? Because Baal is an important figure in the occult elite’s mythology. And he is celebrated on one specific, violent day. Baal (also known as Moloch/Enlil) is an ancient god that was worshiped by civilizations around the Levant. Baal was the name of the supreme god worshiped in ancient Canaan and Phoenicia. The practice of Baal worship infiltrated Jewish religious life during the time of the Judges (Judges 3:7), became widespread in Israel during the reign of Ahab (1 Kings 16:31-33) and also affected Judah (2 Chronicles 28:1-2). The word baal means “lord”; the plural is baalim. In general, Baal was a fertility god who was believed to enable the earth to produce crops and people to produce children. 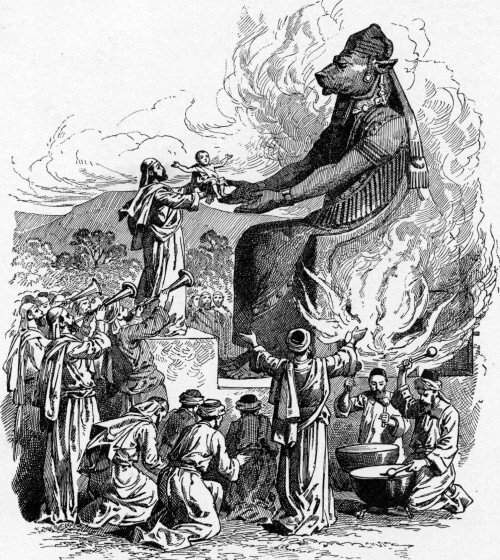 The cult of Baal was particularly brutal as it involved human sacrifices – especially newborn babies. Baal worship was rooted in sensuality and involved ritualistic prostitution in the temples. At times, appeasing Baal required human sacrifice, usually the firstborn of the one making the sacrifice (Jeremiah 19:5). The priests of Baal appealed to their god in rites of wild abandon which included loud, ecstatic cries and self-inflicted injury (1 Kings 18:28). Ancient Biblical passages clearly describe human sacrifices made to Baal. Three years ago, I published an article entitled The End of April: A Time of Human Sacrifice where I explained how the second half of April was a particularly “magickal” and violent period which culminated on May 1st – Mayday. The occult date of April 19th was specifically mentioned. Here’s a short list of awful events that occurred during the second half of April. Knowing these facts, is it a coincidence that a replica of the Temple of Baal will be erected on April 19th? The occult elite is all about symbolism and numerology. Nothing is coincidence. On April 19th, replicas of the entrance to the Temple of Baal will be unveiled in the two most “powerful” and visited squares in the world today: Times Square and Trafalgar Square. This week-long celebration of Baal will take place during his own “holiday”, one that is often celebrated with death. In this bold move, the occult elite is showing its true face and symbolically invites the world to enter the gateway into its dark occult world. So, no, this is not about “architecture” and defying ISIS. 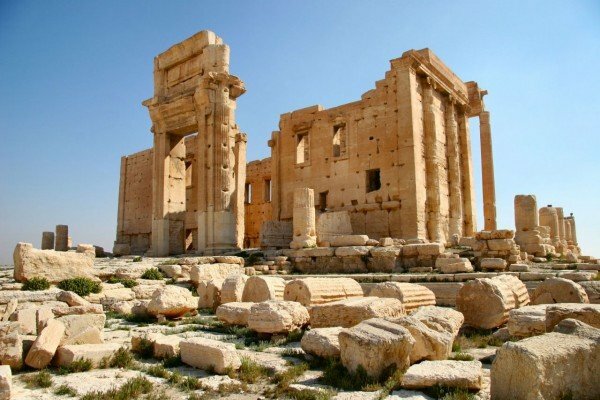 Several ancient, priceless ruins were destroyed by various Islamic groups in the past years. Only Baal will stand tall in New York and London. A Hillary email on wikileaks that talks about sacrificing a chicken to Molech. It’s the last thing on the page. Im reading my bible tru Genesis to Revelations 1 chapter or 2 a day. Leviticus 26 mention Molech and I look it up in da computer. I click on your hyperlink on Moloch/baal. I have read my bible about 2 times or 3 and I have wanted to know who this ancient God’s were. You have made it very clear for me to understand this demon gods. I also did not know that New York and London still practice the worship of Baal. People should come together against this crimes to humanity. They destroying our health, body’s and souls. People need to stop watching junke television and start reading this real events articles and stop the Elite to harm us.